Gun-Carrying Protesters Create 'Tricky' Question For ACLU : The Two-Way "We don't feel we have to represent any group – including white supremacists – seeking to demonstrate with firearms," said the organization, which has long defended groups unpopular with its members. A protester wears a pistol in Charlottesville, Va., on Saturday. The ACLU says it will consider the potential for violence when evaluating whether to represent potential clients. After representing the organizer of a far-right rally that became a brutal melee, the ACLU says it will consider the potential for violence when evaluating potential clients — including whether protesters plan to carry guns. "The events of Charlottesville require any judge, any police chief and any legal group to look at the facts of any white-supremacy protests with a much finer comb," ACLU executive director Anthony Romero told The Wall Street Journal. 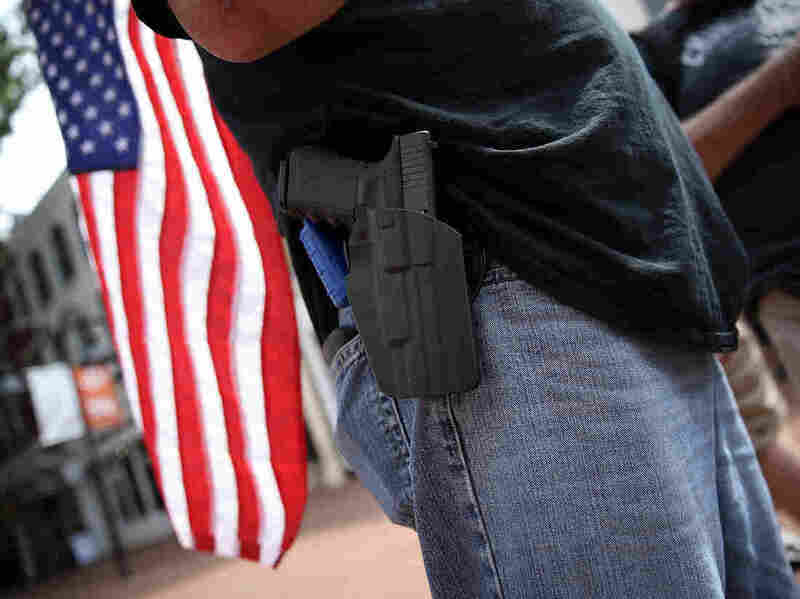 "If a protest group insists, 'No, we want to be able to carry loaded firearms,' well, we don't have to represent them. They can find someone else." The ACLU says this isn't a change in policy. "[W]e don't feel we have to represent any group – including white supremacists – seeking to demonstrate with firearms," ACLU spokeswoman Stacy Sullivan wrote in an email to NPR. "We examine these situations on a case-by-case basis, recognizing that the presence of firearms may suppress speech by others in the public space." ACLU's board policy since October 2015 has been to support "reasonable" firearms regulation, Sullivan says. "The tricky part here is that 46 states allow some form of open carry of firearms," she explains. "We are now looking at the question of whether government can regulate the First Amendment rights of demonstrators who insist on being armed during public protests." The ACLU's legal representation of white supremacist groups has been under scrutiny this week, after it represented the organizer of the "Unite the Right" rally in his fight to keep the group's permit to protest at Emancipation Park in downtown Charlottesville. A participant in the far-right rally plowed his car into pedestrians, killing 32-year-old Heather Heyer and injuring 19 others. Virginia Gov. Terry McAuliffe mentioned the ACLU by name on NPR's Morning Edition on Monday, lamenting the city's foiled attempt to move the protest. "The city of Charlottesville asked for that to be moved out of downtown Charlottesville to a park about a mile and a half away, a lot of open fields," McAuliffe said. "That was the place it should have been, we were unfortunately sued by the ACLU and the judge ruled against us. " The ACLU of Virginia responded that it had "asked the city to adhere to the U.S. Constitution and ensure people's safety at the protest. It failed to do so. In our system, the city makes the rules and the courts enforce them. Our role is to ensure that the system works the same for everyone." But not everyone found that stance satisfying. A member of the ACLU of Virginia's board, Waldo Jaquith, tweeted Saturday that he was quitting his post. "What's legal and what's right are sometimes different. I won't be a fig leaf for Nazis." "We need the ACLU," he added. "We need it *so much*. But we also need it to change, just a tiny bit: don't defend Nazis to allow them to kill people." Donations to the ACLU skyrocketed after Donald Trump was elected president. The group raised more than $80 million between November 2016 and March 2017, and the group's website currently features of a photo of Trump, with the words "The fight is on. Donate monthly." But new donors don't necessarily understand that the group's causes are not always aligned with the political left, and that it has for decades represented hate groups in civil liberties cases. Portland, Maine resident Ella Mock said she had been making monthly donations to the ACLU, but she told Maine Public Radio that in the wake of Charlottesville, she would end her membership . "[T]o know that I have funded in part this activity is pretty terrifying honestly," said Mock. "I have many many friends whose lives and well being I fear for due to this action." In 1978, the group defended neo-Nazis who wanted to march through Skokie, Ill., where many Holocaust survivors lived. The ACLU won its case, but lost 30,000 members — though the Nazis opted to rally in downtown Chicago instead. The following year, the group faced a $500,000 budget deficit. So while it's not new for the ACLU to represent clients unpopular among its membership, the presence of armed protesters – like those who showed up in Charlottesville — has pushed the group into new territory. "We've had people with odious views, all manner of bigots," Sullivan told the Associated Press. "But not people who want to carry weapons and are intent on committing violence."